Bob Ross has developed this unique, ergonomically designed easel. 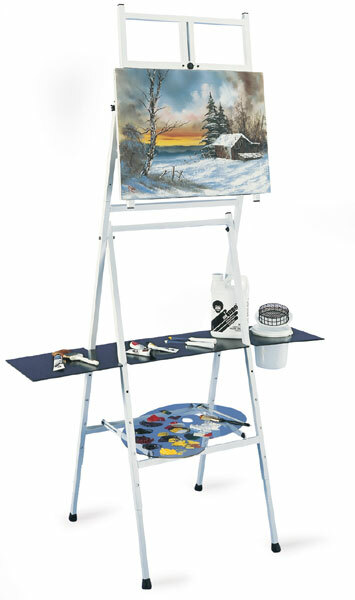 Made entirely of steel, this easel's state of the art design makes it an excellent choice for wet-on-wet and other painting techniques. Sturdy yet lightweight, the Bob Ross 2-in-1 Easel can also become a four legged tabletop easel. Simply remove the upper portion and you instantly have a tabletop easel for the classroom or any other location. Features include a strong shelf for storage of painting materials. 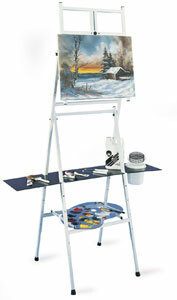 The easel has rubber non-skid feet which protect surfaces. The height and canvas angles are fully adjustable.